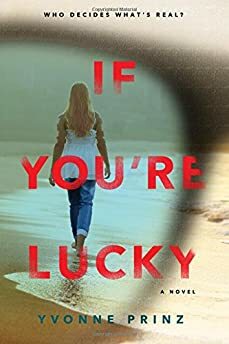 Largehearted Boy: Book Notes - Yvonne Prinz "If You're Lucky"
Book Notes - Yvonne Prinz "If You're Lucky"
Yvonne Prinz's If You're Lucky is a gripping YA psychological thriller that deals with themes of mental illness and loss. "Prinz subtly moves Georgia from credible to unreliable narrator in such a way that neither characters nor readers know what to believe . . . A remarkable exposé into mental illness." If You're Lucky, my third Young Adult novel, came to me in fits and false starts and middle-of-the-night epiphanies and endless rewrites. Some days it felt like the book was a beast that was haunting me, bullying the story out of me. Creating this story was a completely different experience from anything else I've ever written. I believe it transformed my writing, partly because it's my first thriller and partly because the rewrite process was incredibly arduous and I had to live in that foggy town for so long that I went half-crazy myself. There's something to be said for a writing experience that pushes the author to the edge. I think it brings out your best work. I didn't listen to much music while I wrote this book (beyond classical) but I think in song lyrics so I found myself thinking about a lot of music below. I love these lyrics. I think that Oberst wrote this song to go with my story. That isn't true, of course, but the song reminds me of my character, Georgia, and her brother, Lucky. Georgia has always been in awe of Lucky's ease in his life. He brought the world home to False Bay with him when he returned from his adventures and he made it seem small and friendly. After he's gone, Georgia doesn't know how to look at the world anymore. It becomes big and scary. When she starts to lose her grip on things, she knows something very frightening is happening to her but she can't quite define it or express it in a believable way and then it gets tangled up with her mental illness. She disappears into the woods and wakes up in a hospital with a bad case of poison oak. "I fell asleep with you still talking to me and you said you weren't afraid to die"
Georgia is listening to the Stones version of this on her phone while she's baking at the Heron Inn where she works as a pastry chef. That's when Fin arrives back in town and starts to inch his way into Lucky's old life. I like Towne's version of this song better just because he sang everything with raw heart and soul. Mick Jagger and Keith Richards wrote it and they made it into something else, something great too, one of my favorite Stones songs, but Townes suffered from Bipolar disorder and I think that if he met Georgia he might understand a bit about what she was going through. The Felice Brothers are self-proclaimed slouching Hudson River Pirates. They seem to have a song for every occasion. This one speaks to me when I think about what's going on in Georgia's head as she starts to lose her grip. Her delusions start to define her life as she slips away from reality. I love the old-timey feel of this tune. The Felice Brothers are fearlessly atmospheric in their compositions and arrangements. Lots of surf culture in this story. Lucky thrived in that life. He worked here and there and then followed the waves around the world. I've always loved the way this song speaks to that Gypsy life that Lucky embraced. We get to know Lucky through the backstory Georgia tells about her brother throughout the novel. This song goes nicely with that story. The coastline where I set the book in Northern California is one I'm very familiar with and this track is just how I feel when I drive that lonesome highway along the edge of the western world, overlooking the Pacific. There are lots of versions of this Neil Young song but nothing touches the loneliness of this one. I've been following Sam Watts for years and I even had him play a show in my living room. His music is beautiful and haunting and evokes a feeling that I get when I think of moody False Bay and Georgia's grief. Lots of water in this story even though Georgia fears the water. Beirut is a big favorite of mine. They're from Santa Fe but they always seem to be reaching for water in their music. I love their rich multi-instrumental arrangements and their dreamy lyrics. I like this video too. It's reminiscent of the scene where Georgia's family scatters Lucky's ashes into the ocean. I had Nick Drake installed in the hard drive of my brain. He's there whenever I write . ‘Nuff said. When I was creating the Fin character, I delved into some Gypsy Jazz and some Gypsy Punk. I was creating a charmer with Romany roots and a certain worldliness, someone for Georgia to fall for and then start to wonder about. I used this video to keep me on track, though Eugene Hutz (of Gogol Bordello) is much older than Fin, I used him as a template. Fin has that swagger and charm to spare. "Trickster and seductress, we, tap dancing on mine fields every day." In Chapter Nine, Sonia (Lucky's girlfriend) and Georgia take a drive down to a small bar in Bodega (near where Tom Waits now lives, incidentally) to see a Gypsy Swing band. They're surprised when Fin gets onstage to sit in with the band. He's obviously an accomplished guitar player and neither of them knew anything about this. Later in the story it's revealed that Fin is the son of a musician, who was very much like Django Reinhardt. This adds to Fin's mystique and that night at the bar, Sonia starts to fall in love with him. How could she not? I'm a fan of Gypsy Jazz and I loved building a character with a flourish like this, another dollop of intrigue, another layer to explore. This one's a weeper. Georgia is hanging on to her dead brother too tight and she sees him in her dreams, always in the water, always reaching for her. She wakes up gasping for air. I don't remember where I found this song but it speaks to what Georgia is experiencing and her loss. When Georgia meets Cole at the end of the book he starts to call her "Madame George". Cole teaches Georgia how to ride the bus in San Francisco, a small thing, but something she's never done before. This is a nice note to end the book on. And all the little boys come around, walking away from it all…"